OK. It’s that wonderful NCAA tournament time of year. The word is parity (again!) and I sort of believe that—in the sense that the early rounds are a crapshoot, and there are eight or 10 teams that could reach the Final Four without raising any eyebrows. That said, here’s my low-brow crapshoot. Quick synopsis: As usual, I probably have too much junk in the early rounds, and not enough in the Final Four. But hey, I hit all four Final Four teams last year, so I’m due for a letdown. 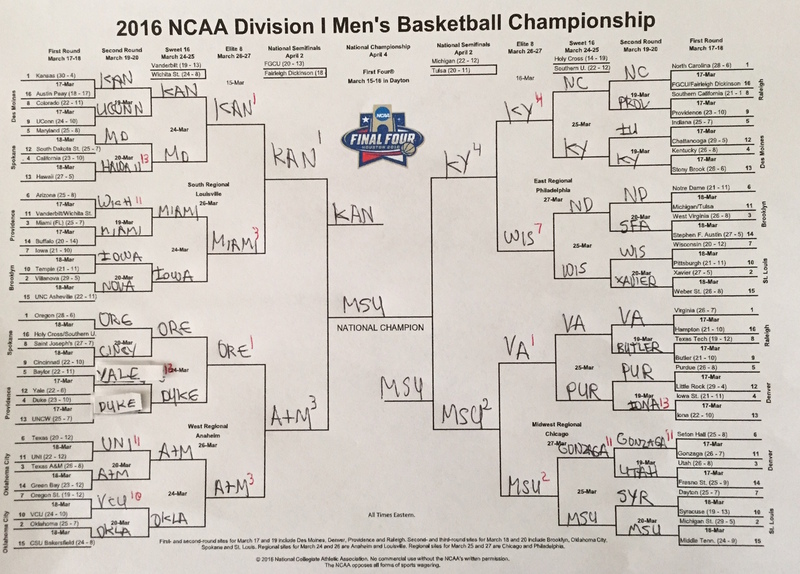 If this bracket is helpful, you’re welcome. If it’s not, past performance should not be taken as an indicator of future results. A couple of notes: The upper-right (East Region) portion of the bracket, which is designed to pit North Carolina vs. the Kentucky-Indiana winner, is a gem. Kentucky-Indiana was the toughest call of them all for me—such a 50-50 game. Love those two point guards. Any of those three teams could wind up going very deep. There are so many people on the Kansas and Michigan State bandwagons that people with the courage to pick against them could reap the benefits. Maryland, Miami, Virginia and Utah are certainly worthy. I just think the battle-tested Jayhawks and Spartans look bullet-proof. The West also could be wild. Oregon and my pick, Texas A&M, are solid. Oklahoma deserves much consideration. And even though I seriously considered an early knockout by North Carolina-Wilmington on Duke, the Blue Devils have the potential to hang around a long time. Good luck. And remember to enjoy the games. Brackets inevitably go down in flames. When it comes to March Madness, it’s all about the drama in the best sporting event of its kind. Please click on on images to view larger version.